Cathy was talking about a recipe for protein balls which she saw on the back of a packet of Ready Brek she had for breakfast that morning. It was suggested then that the class should try to make the protein balls. We got all the ingredients together and the children helped with weighing, peeling, cutting and mixing the carrot, apple, dates, pumpkin seeds and porridge oats. We had to use a blender to get the texture right for the protein balls. While they were balking we chatted about the ingredients. Rose said the dates tasted like raisins, while Conor said he didn’t like them! Leah said the pumpkin seeds were crunchy and Tiarnan said he really liked them. As the interest was so high we are going to search for other protein ball recipes with different ingredients and try to make them. We were experimenting painting with cotton in pegs. The kids were exploring with pegs and cotton before painting and thinking about how to put them together. We showed them how to do it and they were trying really hard! After a few practises they started their master pieces using paint and our ‘new brushes’. They had so much fun painting with something different. Next time we can try painting with another material- maybe leaves or wool. Using different materials helps their creativity and fine motor skills. Parents were delighted to see the children exploring new ways of doing art. 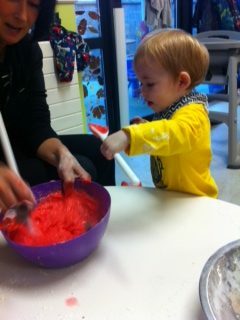 Last Wednesday the babies were making play dough. They loved the rain shower of flour when we put it through the colander. Killian and Jacob wanted to put their heads under it! When all the rain had stopped we mixed the flour with water and red paint and the children helped to mix it all up. They really enjoyed the mixing and some were really keen to taste it. Once it was made the children created different shapes out of the red play dough. We decided to keep the playdough and continued to make different shapes throughout the week. As it was nearing Halloween we made spiders and worms. Parents said that playdough was a lovely activity and delighted that they were doing it in creche.